On its 6th year, Customer Love Fest 2017, the pioneer conference on Customer Loyalty, Customer Experience and Customer Relationship Management, will now also focus on Customer Retention and Digital Immersion in line with this year's theme, "Embrace the Customer-Centric Revolution." Aimia, Inc. Business Loyalty Consultant Steven Ladd, PLDT Digital Evangelist and Transformation Agent Carlo Ople, DIGITS (Beyond the Box and Digital Walker) VP for Customer Experience and Information Systems Glenn Ong, Avail.at Business Head Bea Hernandez and People Ignite Chief Executive Igniter JV Wong are announced as the first set of guest speakers for this year's Customer Love Fest. The speakers came from various backgrounds in retail, technology, customer loyalty and customer experience. 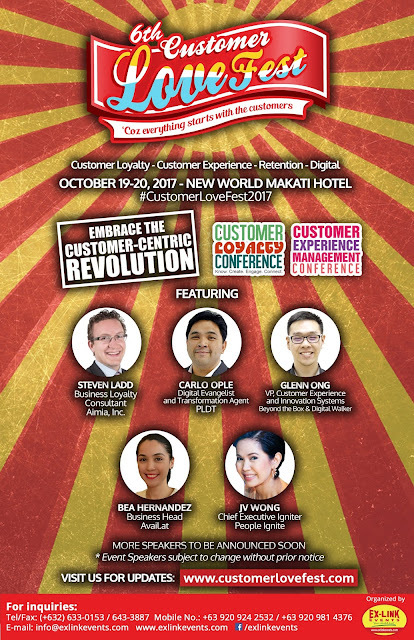 The Customer Love Fest is a two-day event to be held at the Ballroom of the New World Makati Hotel on October 19 to 20, 2017 from 9:00am to 5:00pm. Seats can now be reserve by calling Ex-Link at (02) 633-0153, 643-3887, (+63) 920-981-4376, (+63) 920-924-2532; by email at info@exlinkevents.com or via Facebook Messenger (@CustomerLoveFest or @exlinkevents). Event speakers subject to change without prior notice.